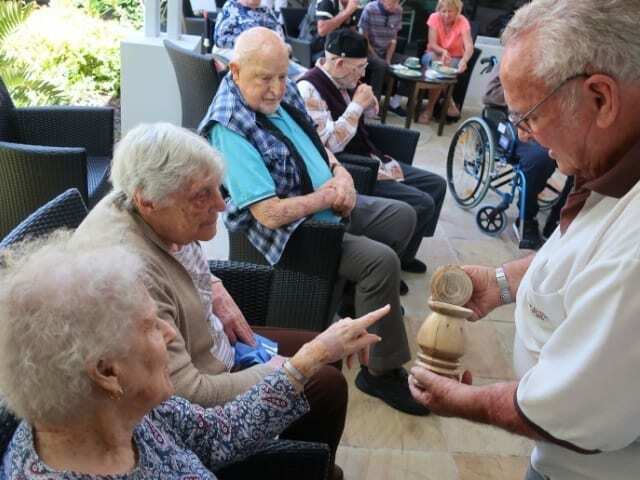 Clients at Arcare Helensvale St James were treated to a woodturning demonstration by Gold Coast Woodturners Inc.
Clive and Jack were on hand to give the demonstration. The demonstration was initially for the Men’s Group however many ladies were also interested and many of them came to join in. Clients from our other Arcare residences on the Gold Coast (Helensvale, Hope Island and Sanctuary Manors) also visited for the demonstration and morning tea. Clive and Jack explained that Gold Coast Woodturners Inc is a commercial operation which started in 1983 and it’s one of the oldest and largest specialist Woodturning clubs in Australia. The club currently has over 110 members ranging in ages from 16-90, both male and female and it is surprisingly popular with the ladies. One of our clients Neville McKavanagh was very much looking forward to this demonstration as he was a Woodturner himself. Neville was proud to show everyone a paper towel holder that he made himself and he was happy to say that most of his family have got one of these holders as a gift. Coffee, tea, sausage rolls and mini pies were served, family members who were visiting also joined in. There were a few merchandise items like pens, clocks, wooden bowls on display for anyone that wanted to purchase a gift. Little samples of the saw dust in a gift bag were handed around to take as a souvenir and the finished products were on display afterwards for all to see. 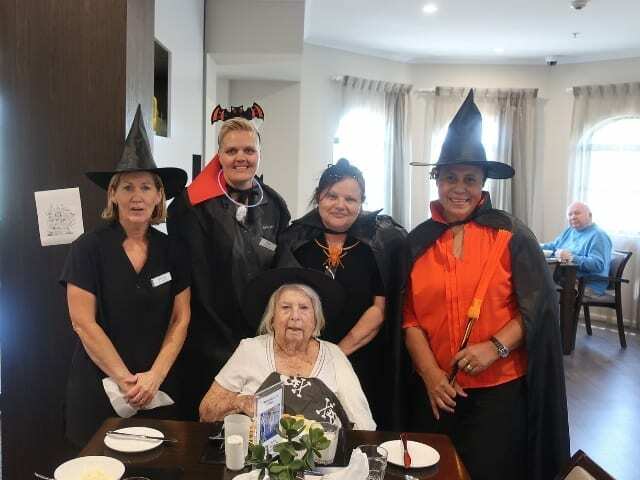 Arcare Helensvale St James transformed into a spooky place for Halloween. When asked what Halloween meant to them, feedback from clients was mixed. Some said that it is an American tradition, others said that it is for the shops to sell lollies and merchandise, and everyone agreed that the kids will all go crazy and active after eating all the sweets! Team members decorated the residence with spooky spider webs and dressed in their favourite costumes. Dressing up for fun and having a laugh is the best part of Halloween commented many clients. Team member Christina brought in lots of treats for team members and clients to share. Finally, a special lunch was served in all dining rooms to keep with the theme.